story of survival, resilience and courage." I don't even know where to begin this review other than to say bravo to author D. M Annechino. 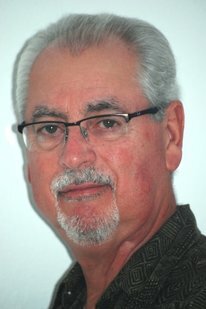 He is someone I've had the pleasure of reviewing several times, but for books in quite a different genre. They Never Die Quietly, Resuscitation & A Piece of You are mystery/thriller/suspense works of fiction with an edge - they feature disturbing serial killers. 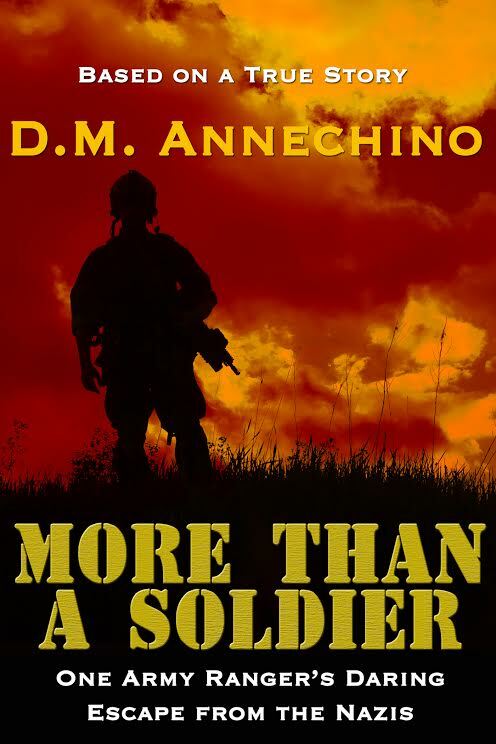 I believe More Than A Soldier is his first true life story - a military biography/memoir. It is his uncle's memoir of his time as a soldier. I cannot find where I read this, but I believe his uncle refused to talk about these experiences until his final days. It was only then he chose to share his memories of his time as a soldier with his son. His son then asked his cousin (D.M. Annechino) to turn the many notes he took into a book. It was a wise choice as Annechino nailed it. In fact I think this is hands down this author's best work yet. Angelo J. DeMarco's story begins when the young patriot answered his country's call to service. He first joined the army, but wanted more. 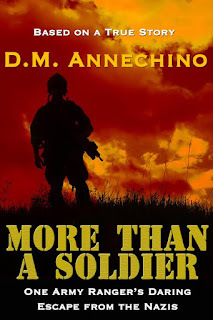 The story moves on to explore his time training as a Ranger and through numerous difficult wartimes memories where many of his fellow soldiers died in combat. From there we live through the dreadful time of his troop's capture, his daring escape behind enemy lines with three fellow Rangers and his ordeal surviving many months behind enemy line until Allied troops arrived. Annechino captures these events with a personal eye, letting each unfold as if his uncle is setting across the table from the reader with a cup of coffee in hand, sharing his vivid memories. I honestly couldn't put the book down. And the way Annechino crafted this story had my mind creating pictures of the events as I read along. Months later I can still "see" many of these moments in the book in my mind's eye. Again, bravo to the author. I hope to see him offer new titles in this genre in the future. The storytelling talents so evident in his works of fiction are perfect for helping a true-life story come to life.